Kylie Cravens, a mother from Illinois, shared photos of her three-year-old daughter after having a severe allergic reaction to kid’s makeup on Facebook. The photos show her daughter Lydia in a hospital bed with blisters in her eyes and lips. 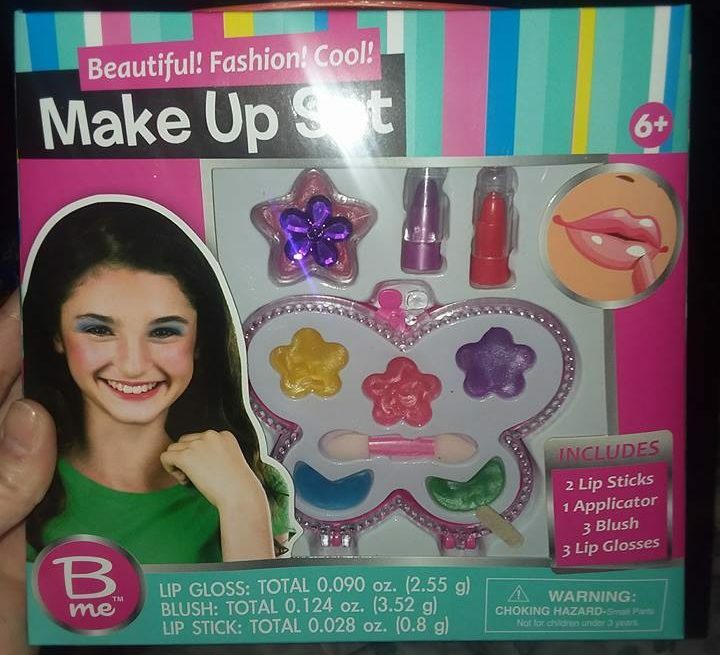 According to the mother, they bought a kid’s makeup set for Lydia from the Family Dollar store in their town, thinking that it was “harmless and non-toxic.” They have also bought a similar makeup set for her daughter before, but “just a different brand.” After a day of playing with the set and applying the makeup to her face, Lydia began having rashes in her body and blisters on her face. The allergic reaction was so severe that Kylie and her husband had to rush the 3-year-old to the hospital, where she was confined for days. “In 24 hours our little girl went from 100% healthy to her eyes swollen and blistered shut… with a rash all over her body that we would have to apply cold packs to every 30 minutes or so because her skin was burning … she was unable to eat much for days because of the blistering and cracking of her lips,” the mother wrote. Lydia had an allergic reaction to an unspecified chemical in the product, which could mean that it is an isolated case and would not have the same effect on other children who are not allergic to the particular chemical. Randy Guiler, Family Dollar’s vice president of investor relations, told Refinery29 in a statement that they are aware of the post but has not been contacted by the family. “In 2016, we purchased a supplier’s product matching the photo in social media. In accordance with our procedures, our supplier’s product had been independently tested for toxic chemicals. Upon being made aware of this incident, we re-confirmed that test results showed that no toxic chemicals were found in these make-up kits. We have received no other complaints or claims of allergic reactions related to this product,” he said. Fortunately, Lydia is now home from the hospital after more than a week. While still recovering from some after effects, Kylie assured the readers that her daughter is doing better.